Set of three light and medium truck adapters to increase brake lathing performance and brake component mounting capacity. Lathe drums and rotors to smooth, micro-finished perfection like never before, even on light and medium trucks. The precision-hardened steel adapter increases lathe performance and brake component mounting capacity. Fits RL-8500 and RL-8500XLT brake lathes and helps deliver a superior micro-finish on drums and rotors, composite and standard cast applications and most flywheels. Features single setup, self-centring, and extra mass for maximum vibration damping providing better results with less chatter. At last, single-pass lathing perfection is in your power, even with some of the largest standard drums, rotors and flywheels, regardless of their material. This adapter set for hubless cast/composite light truck rotors, drums and flywheels will cover most automotive rotors and drums in service today, including light-duty trucks. Eliminates the need for inaccurate, out-of-date bell adapters. 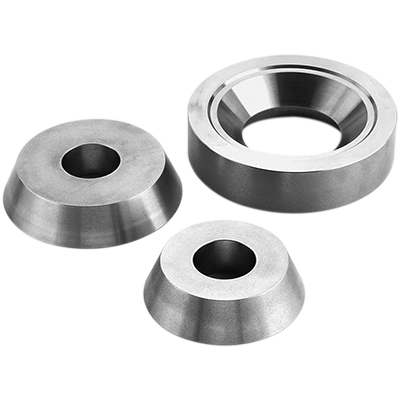 These advanced brake lathe adapters feature Ranger's patented neoprene, rubber-banded flange plates. Rubber-banded flange plates help reduce harmonic vibration and chatter, virtually guaranteeing increased performance levels on most 25 mm arbor lathes. They also provide a superior micro-surface finish. Single setup and self-centering with extra mass for maximum vibration dampening, these adapters are also easier to use and safer to handle. Proper brake lathe machining techniques demanded by original equipment manufacturers continue to improve as customers expect higher-quality service. Why replace a customer's expensive rotor when you can machine it? Ranger is committed to utilizing only the highest quality, high-mass flange plate adapters.